New York City FC has a new Chief Executive Officer. The Major League Soccer club announced Tuesday that Brad Sims will become CEO in January. Sims will be responsible for all aspects of the organization on a day-to-day basis and lead the front office staff. Sims joined the club after six years with the NBA’s Cleveland Cavaliers. where he served as executive vice president of franchise operations and chief revenue officer. Je was responsible for managing all primary areas of revenue for the Cavaliers, including ticket sales, premium seating and hospitality, corporate partnerships and database marketing and analytics. He also managed all business operations for Cavs Operating Company franchise properties. Sims joined the Cavaliers in 2012, helping grow revenues by double-digits for two consecutive years prior to a run of four consecutive NBA finals appearances in 2015-2018 in which the Cavs ranked at or near the top of the NBA in every revenue category. A former New Yorker, Sims spent four years at the NBA league office in New York City serving as vice president of team business development, team marketing and business operations. He worked closely with NBA, WNBA and NBA G-League teams to provide strategic direction. Sims has 22 years of sports industry experience and is a 2015 Sports Business Journal 40 Under 40 honoree, as well as a Leaders Global Under 40 Award Winner. Sims, an avid soccer fan from a young age, according to an NYCFC press releases, was part of the 69,000 crowd at the Rose Bowl during the opening weekend of Major League Soccer’s inaugural season in 1996. 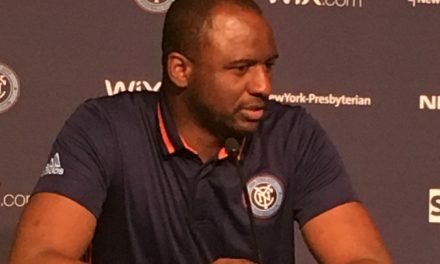 “I am excited and honored to begin this leadership position at New York City FC and City Football Group,” Sims said. 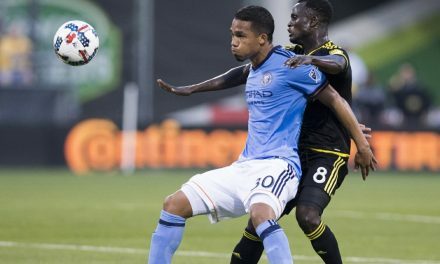 “There’s no better time to be a part of soccer in the United States and NYCFC has quickly become a key pillar within the league. With the sport growing so rapidly in the U.S., and with City Football Group’s original global proposition, this is the place to be. The press release stated that a “smooth transition is assured” with club president Jon Patricof joining NYCFC’s board of directors as his three-year contract comes to a close.